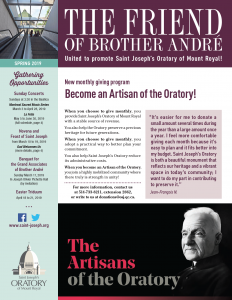 The Friend of Brother André newsletter is published four times a year to promote the activities of the Saint Joseph’s Oratory and to publicize ways of financially supporting this great work. It is sent to those who contact Saint Joseph’s Oratory in order to make a donation, become an Associate of Brother André, subscribe to The Oratory magazine, order religious items by mail, register a group pilgrimage, etc. The bulletin was first published by the office the Associates of Brother André in February 1956 titled as S.O.S. and renamed The Friend of Brother André in November 1956. It has always been produced in two languages: a French version and English one. Would you like to receive the printed newsletter by mail (without any charge) ? To read previous issues of the Friend of Brother André Newsletter, please consult the archives.